Feeling Contemptible? What Does God’s Word Say? Take away reproach and contempt from me, for I observe your testimonies. Reproach and contempt are two words which mean essentially the same thing. They describe a condition of shame or disgrace, a disrespect. They convey the idea of being despised, whether by taunting, scorn, or judgment. Here the psalmist asks God to take away any reproach or contempt, as a result of his keeping or observing the testimonies of God. 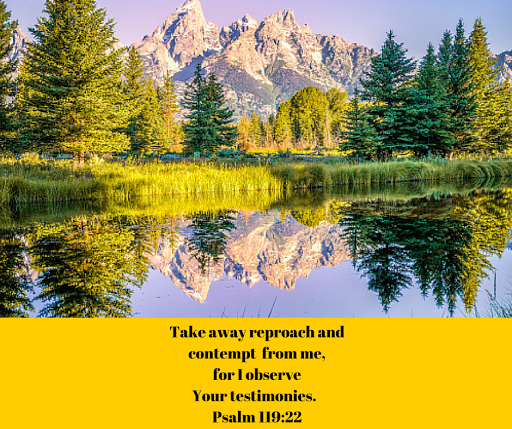 The psalmist concludes that if he keeps the testimonies, then God should in turn remove any reproach or contempt. Testimonies are used to describe the precepts of God; the word is used interchangeably through Psalm 119; other words to describe God’s laws are commandments, precepts, statutes, word, ordinances, and law. We can look at this verse in two ways. First, reproach and contempt is a condition. Before we come to Christ, we are truly a reproach. We are contemptible. God tells us that He hates sin, and it is an abomination to Him. Proverbs 6:16-19 – There are six things which the Lord hates, yes, seven which are an abomination to Him: Haughty eyes, a lying tongue, and hands that shed innocent blood, a heart that devises wicked plans, feet that run rapidly to evil, a false witness who utters lies, and one who spreads strife among brothers. Proverbs 14:34 – Righteousness exalts a nation, but sin is a disgrace to any people. The King James reads sin is a reproach to any people. We are enemies of God. Ephesians tells us before salvation, there was enmity between us and God (a word that means hostility, or hatred). James 4:4 – You adulteresses, do you not know that friendship with the world is hostility toward God? Therefore, whoever wishes to be a friend of the world makes himself an enemy of God. Ephesians 4:14-16 – For He Himself is our peace, who made both groups into one and broke down the barrier of the dividing wall, by abolishing in His flesh the enmity, which is the Law of commandments contained in ordinances, so that in Himself He might make the two into one new man, thus establishing peace, and might reconcile them both in one body to God through the cross, by it having put to death the enmity. This same verse in Ephesians, however, reminds us of the answer to the removal of the contempt and reproach we bear as sinners. Christ took our reproach on Himself! 1 Peter 2:24 – And He Himself bore our sins in His body on the cross, so that we might die to sin and live to righteousness; for by His wounds you were healed. To remove the condition of contempt and reproach, we call on the Living Word of God – Jesus, our Savior! And even when we sin after salvation, we do not take on sin’s reproach, because Christ has removed it completely. Romans 8:1 – Therefore there is now no condemnation for those who are in Christ Jesus. Romans 8:33-34 – Who will bring a charge against God’s elect? God is the one who justifies; who is the one who condemns? Christ Jesus is He who died, yes, rather who was raised, who is at the right hand of God, who also intercedes for us. Praise God! We do not have to bear our contemptuous and reproachful condition any longer! Christ has freed us forever! We are justified (counted as righteous). There’s a second aspect of reproach and contempt, however, that we face even as believers. This is the emotionof contempt. Have you ever done something wrong, after salvation? Of course you have. We live in sinful, human flesh and we will not be perfect until we meet Jesus face to face. We have all felt the shame and reproach of our sin as believers. The difference is this is a feeling, or an emotion. Don’t get me wrong … Holy Spirit conviction is a good thing! We should feel a sense of shame when we grieve our dear Savior who has given everything for us! And it is a reproach on Christ’s name when we sin. We “mar” His witness, we bring shame on His name. But Christ does not intend for us to live in reproach. How does His word take away our reproach? First, His Word is preventive! If we live in obedience to God’s word, we will not make choices that bring Him shame or disgrace. We will make the right choice, that brings honor to God and blessing and joy to our own life. Secondly, His Word is curative! By that I mean when we do sin, God’s Word is able to speak life and peace and joy into our soul, after we have repented. There’s nothing better than restoration. God’s Word is how we, in a sense, “make up” with Him! His Word contains words of joy and peace; the Word reminds us of how great His love is for us, and that He desires to show us compassion. As we read of the failures of God’s great saints in the word, and see how He was able to restore them, and continue to use them for His glory, it gives us hope! There’s one other aspect of reproach that I want to consider. Sometimes, obedience to God’s word will actually bring reproach on you! What do I mean by this? If you are truly committed to living a life of sold-out, passionate discipleship, your life is not going to look like the current culture dictates it should. The world is not going to be your biggest fan! In fact, if you are committed to living a pure and holy life, your presence in the face of ungodliness and wickedness will likely not be appreciated! You may be held in “contempt” by those whose reject God. But is this truly a reproach? Remember Peter? Peter experienced both the condition of reproach (his own sinful condition before salvation), and the emotionof reproach. He denied Christ, and I’m sure he deeply felt the shame and disgrace of that moment, but thankfully, Christ lovingly restored him. But he also knew something about the reproach of the world. 1 Peter 4:12-14 – Beloved, do not be surprised at the fiery ordeal among you, which comes upon you for your testing, as though some strange thing were happening to you; but to the degree that you share the sufferings of Christ, keep on rejoicing, so that at the revelation of His glory you may rejoice with exultation. If you are reviled for the name of Christ, you are blessed, because the Spirit of glory and of God rests on you. If we are reproached and contemptible to the world, we are blessed. According to Peter, we are to consider it an honor and privilege to share in the sufferings of Christ. Our great hope is that the reproach and contempt of the world is not the final word on our life. Jesus gave us an illustration of what it will be when we enter heaven. To the faithful servant, the master gave words of commendation. Matthew 25:21 – His master said to him, ‘Well done, good and faithful slave. You were faithful with a few things, I will put you in charge of many things; enter into the joy of your master. I don’t know about you, but I’m not worried about what this world thinks of me. I long to hear the word of commendation from my Father, that He is pleased with me and finds me faithful! Since He has removed the condition of reproach and contempt from me, and provides me His Word so that I can live an obedient life that will not bring reproach on His name, and heals my heart of any shame or disgrace that comes when I fail Him, I can suffer through any contempt His enemies might hold for me! And I love His Word. Do you know that God is good?